Afterglow following a spectacular sunset above Mitre Peak on Milford Sound in Fiordland, New Zealand. Trey Ratcliff is, arguably, the world’s most famous contemporary photographer. His website, Stuck in Customs, draws a huge worldwide audience. Trey and I met while photographing the sunset at Milford Sound. That’s a testament to the power of photography to bring like-minded people together in friendship. While often a solo pursuit photography can also bring folks together through meaningful discourse coming out of an appreciation of world and, on occasions, a concern for its future. Camera clubs, professional associations and online communities are examples of the power of photography to bridge barriers and form connections that can bring like-minded folk together. Explore subject matter and, in doing so, ourselves. Look at the world around us in a deeper, more intuitive manner. Question our relationship with the natural world and our link with the sublime, what ever you consider that to be. Photography is many things: hobby, passion, craft, art. It’s a meld of technology and personal expression and, as such, is its own special king of alchemy. Milford Sound is a huge body of water on the South West Coast of the South Island of New Zealand. 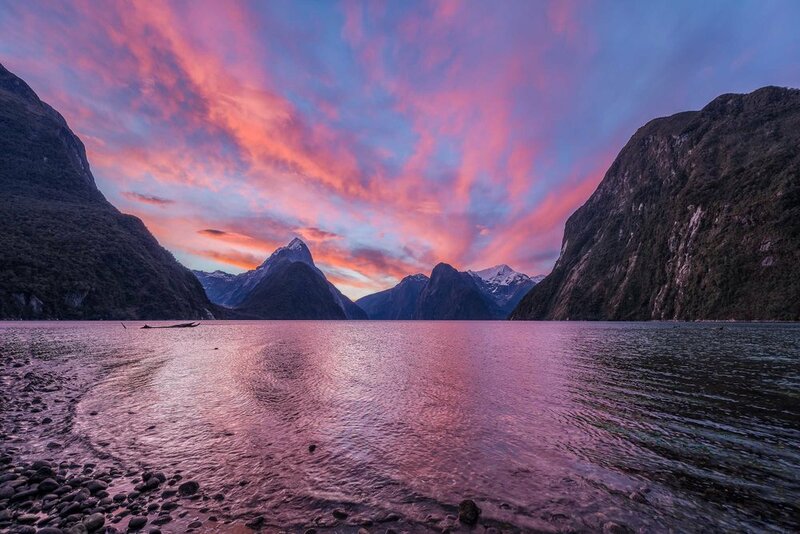 It’s an extremely beautiful location though, with rainfall calculated at a mean average of 6,813 mm ( ) per year, it rains frequently and heavily at Milford Sound. In fact Milford Sound is the wettest inhabited place in New Zealand, and one of the wettest places in the world. I arrived just before sunset and was treated to a wonderful display that continued onto the spectacular afterglow showcased in the photo directly below. One of the advantages associated with photographing so far from the equator is that light tends to linger at the edges of the day. This simply means that your opportunities to create beautiful photos are greatly enhanced compared to the speed at which the sun rises and sets close to the equator. A spectacular afterglow illuminates the sky above Mitre Peak and surrounding mountains on Milford Sound in Fiordland, New Zealand. Actually it was at this very spot where I made a new friend. I had parked my car a few hundred meters away and immediately knew where I wanted to be to photograph the sunset. However, as I approached the water’s edge I became aware that there was another photographer already there. I hung back in a forested area, just short of the shoreline, thinking I should let him make his own photos without interruption. I did get concerned when it was evident he wasn’t going to move. What’s more he was talking, constantly, and at a volume that seemed inappropriate for such a sublime location. I soon realized that he was making a video so, again, I waited. Once he’d finished I moved out of the trees and began to set up my tripod nearby. Exercising what I believe was an appropriate degree of etiquette for a photographer, I excused myself by saying something like ”I hope you don’t mind, I’II be sure to stay out of your way”. He responded very positively. I then recognized him and greeted him again by name. He came over to shake my hand. It was Trey Ratcliff, a great guy and a really genuine bloke who I’m happy to call friend. It was a truly spectacular sunset and afterglow, all the more fun to be sharing it with a kindred spirit like Trey. We met again for drinks later that night, where we were joined by Trey’s intern as well as my travelling companion, and again the next morning between a sunrise photography session and a boat tour of Milford Sound that I was about to embark upon. I remember telling Trey that night that he should open his own online photography school. I could tell by his response that this was something he’d already thought about. Actually it did come to pass that Trey, together with several partners, launched the Arcanum. I’ve so happy to have been involved in this glorious project, as a Master, and am very disappointed that the Arcanum is closing its doors at the end of the month. I’II be launching my own online photography education site in a few weeks time and I’II share information about that experience with you here soon. A view from a sheltered bay in the spectacular Milford Sound in Fiordland, New Zealand. At thirty-eight photos my New Zealand Photography Collection is significantly expanded and features images from Queenstown, Arrowtown, Wanaka and Milford Sound. Feel free to check out my New Zealand Photography Collection and return down the road aways as I’m always adding to the gallery page on this site. I love Australia and feel very fortunate to have been born here. Sometimes I think, if my numbers came up, it would be nice to spend more time based elsewhere. New Zealand and Europe, with regular explorations around the world and restful breaks in Bali and Singapore sounds interesting. Why New Zealand? It’s spectacularly beautiful with so many amazing locations for landscape photography. And living on the South Island puts you in range of so much of that beauty. What’s more I very much like the idea of living on the edge of a lake in my very own hobbit hole. And why not? Hobbit holes come with big wide doors and generously stocked larders. The dramatic Cleddau River rushes towards the sea near Milford Sound in Fiordland, New Zealand. One thing I’ve learned along life’s path is that dreams don’t have to be altered all that much to make them a reality. Queenstown (New Zealand) is a relatively short flight from Melbourne, and I could easily spend a few weeks a year driving around and exploring the many opportunities the South Island offers for great landscape photography. Not only that, but I can easily fly from Queenstown to Auckland and drive down to Matamata to visit Hobbiton. After second breakfast and a refreshing ale in the Green Dragon I’d be content in the extreme. I’m very much looking forward to my next trip to New Zealand. It will be a wide ranging driving trip planned around amazing locations for landscape photography. Perhaps we’ll meet there. I’m easy to spot as I smile a lot. Please feel free to share this post, widely and wildly.